James Shaw ventures to Christchurch next weekend and, as of tonight, now he knows who his opponent will be. Shaw, the IPW Champion, issued an open challenge to anyone willing to step up at APW Conflagration (Saturday, June 27) and face him in a non-title bout. While several members of the APW roster volunteered to take him on, Shaw grew frustrated with vague responses from T-Cole, who would neither confirm nor deny whether he planned to answer the open challenge. After being called out directly, T-Cole has accepted Shaw’s challenge and will meet the IPW Champion in the Conflagration main event. Both men now have five days to prepare for their bout this Saturday, June 27. Shaw vs. T-Cole headlines a top-heavy card from Aftershock Pro Wrestling, with two title matches scheduled for Conflagration. KPW Women’s Champion Scarlett defends her title against Australia’s Vixsin, and Charlie Roberts defends the Hughes Academy Championship against Aaron Henry in a first-time meeting. 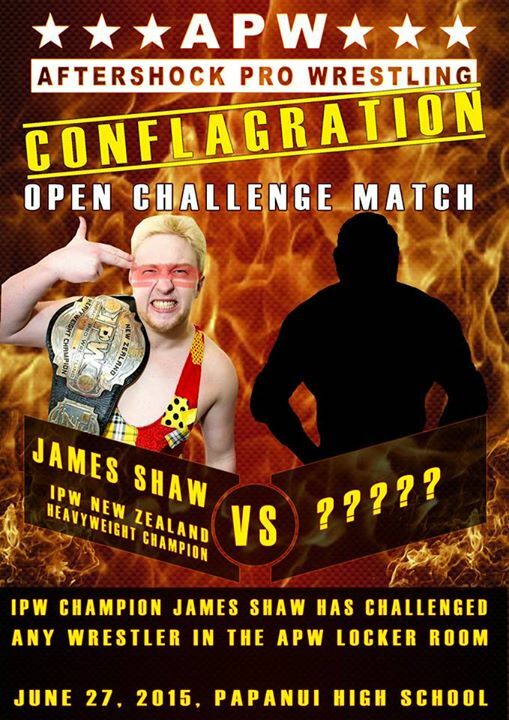 APW Conflagration takes place this Saturday, June 27, at Papanui High School in Christchurch..